Landscape lighting can help brighten the holidays for all who visit or pass by. When planning the holiday landscape lighting, don’t forget the outdoor tree lights, shrubbery, buildings, and yard decorations. The many lights available to illuminate your landscape lighting include string lights, rope lights, icicle lights, and novelty lights. String lights and novelty lights are great outdoor tree lights. String lights, rope lights, and icicle lights are perfect for shrubbery and buildings. Yard decorations can be lit by all forms of Christmas lights. Landscape lighting looks best when planned in advance taking care to balance out colors and symmetry and identifying a focal point. Color schemes look best when deciding to use all multi-colored lights or monochromatic lights. The monochromatic white color scheme has been popular in landscape lighting during recent years. Done properly, both warm and cool white colors can be blended in landscape lighting to make an especially attractive display. Don’t ignore symmetry in planning. Landscape lighting looks best when lighting all areas of the yard and keeping in mind both horizontal and vertical placement. Novelty yard decorations, like a nativity scene, make a good focal point. Landscape lighting will help make the holidays more festive and joyful. Holiday tree lighting has been a popular Christmas tradition for more than a century. At one time, people illuminated their indoor trees with candles. Flammability issues limited the amount of time people could enjoy this. Typically the tree was decorated and lit for only a day or two. 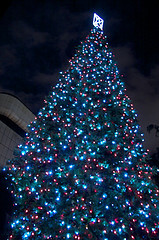 The introduction of electric string lights in the late 19th century allowed people to enjoy their tree lighting longer. As the indoor tree lighting tradition continued, people started to illuminate their outdoor trees. Today, outdoor tree lighting can be found in many neighborhoods. There are many more choices of indoor and outdoor tree lighting available today than there was years ago. In addition to traditional electric string lighting, there are more energy efficient LED lighting and non-electric solar lighting. Both options cost a little more up front but, in the long run, are more cost efficient. Novelty shapes like Starlight Spheres or Snowflakes can be particularly festive outdoor tree lighting. The beauty and splendor of decorating for the holidays with tree lighting makes a very special time of year filled with fun, hoopla, and warm tender moments with people we care about. Share season’s greetings with family, friends, and neighbors by means of festive lighting. Festive lighting can make the holidays more enjoyable with feelings of increased energy and joyful mood. The holidays are about peaceful reflection and are a time to spend with family and friends. Festive lighting can make the season more special by creating a peaceful, reflective mood with dim soft lights or by creating a vibrant party mood with bright twinkling lights. Festive lighting can be created by lighting trees, shrubs, and buildings, arranging luminaries along walking paths, hanging lit ornaments, lighting indoor trees, lighting garland that is draped on mantles and banisters, spotlighting special decorations, grouping candles in decorative displays, etc. Festive lighting can highlight the “true meaning of the season” by spotlighting a nativity scene displayed outside. Festive lighting can ignite the spirit in all of us. Color your holidays bright with festive lighting.